Papermill held their Troutmasters competition fish-off on Saturday April 13 and it was a great day. Fishing was steady all day with some nice fish coming out and the conditions weren't bad. There was a great ripple on the lake due to an easterly wind, but going into the afternoon it went warm with bright sunshine but this didn't stop most anglers catching their bag limit of 4 fish. The winner of the Troutmasters competition was John Turner who caught 4 fish with a total bag weight of 20lb 13oz. Second place went to David Rees who caught 4 fish with a total bag weight of 17lb 8oz and third place went to Ryan Perham who caught 4 fish with a total bag weight of 14lb 4oz. John Turner turned down his place in the final at Draycote and the fishery will be represented by second-placed David Rees. We would like to thank all the anglers that took part in this year’s Troutmasters competition fish-off. Despite mainly very cold east winds there have been some excellent catches, including good numbers of fish taken on various dry fly patterns. On the Boathouse Pool Mr Porritt took 2 fine rainbows for a combined weight of 13lb and returned a further 4 fish. A visitor staying in Glen Logie Lodge returned 9 fish and Mr Egan returned 7 in a short morning session. Water clarity has mainly been very good and smaller flies such as Buzzers and Crunchers have dominated the catches. However, some decent results have also been had on Squirmies and lures (Yellow Dancer). Tam Costello was the main man on the Burnside Pool releasing a fair number of fish during the week, including some superb rainbow trout estimated at 8lb, 9lb and 12lb. On Sunday the Simpson/McPherson combination conquered the conditions to return 20 fish whilst Peter Thomson (fishing dries) and Alan Green each returned 7 fish in short sessions. Anything from Buzzers to Blobs worked at the correct time. The best pool this week was the Bankside, where some outstanding catches were recorded. Frank Sherriff and Mr Sutherland returned 20 fish each. Jock Leslie released 19 fish (with the best being a magnificently conditioned rainbow estimated at 12lb-plus) and Grant Burnett followed close behind on 18; all were taken on dry fly patterns! Mr Duggan also enjoyed a decent day’s sport releasing 11 fish. The Woodside Pool (any legal method) has been stocked with some larger than usual fish including an excellent rainbow weighing 11lb 2oz which was caught by Mr Crosbie. Ollie Lucien also landed a fine rainbow weighing 9lb. On Friday 12 fish were taken for a total weight of 31lb (averaging 2.58lb) while on Saturday 18 fish were taken for 54lb (averaging 3lb). Yellow or green Powerbait fished beneath a float was the most successful method. 31 anglers caught 116 fish of which 112 were safely released. Flies doing well are white lures, black lures, Buzzers, Blobs and Daiwl Bachs. Fish were moving up and down dependent on cloud cover. Cold north easterly winds made casting tricky on some days but most anglers managed to catch and some even made double digits. Open as usual over the Easter weekend. Black or Olive Buzzer, small Damsel, Bloodworm, Olive Cruncher, Red Diawl Bach, Tequila Blob, Olive Shipman’s, and Olive CDC. A total of 12 days of cold north east or east winds but the fishing remains excellent for boat anglers and good for bank anglers who are prepared to fish the far end of the lake. On days with a light wind there are good numbers of fish rising with dries or floater/washing-line the best methods. In a stronger breeze the fish have dropped down to 2-4 feet with a small unweighted Damsel or Apps’ Bloodworm on the point and small Buzzers or Diawl Bachs on the dropper. At the lodge end of the lake the fish continue to be out of range of bank fisherman. Boats are using a team of Buzzers or weighted Damsels 8-12 feet down to locate fish. The forecast milder weather over the Easter period should see larger buzzers hatching and even more surface activity. Forthcoming competitions: Sunday May 5, Geordie Mountford Boat Pairs. Open to everyone. A memorial match to commemorate a superb fly-tyer and all-round top bloke. You fish with your partner. 12 fish limit for the boat. 9am - 4pm. Entry fee including fishing permits £70 per pair. Richard Winser has kindly supplied a stunning trophy for the winners along with medals for the top 3 pairs. Tackle prizes will also be on offer. Come and fish a friendly competition at peak buzzer time! Sunday May 19 Elinor is holding a heat of the Scierra Pairs. Entry forms available at Elinor or www.scierrapairs.co.uk One in four pairs will qualify for the Grafham final on September 8. As usual April has produced some very variable weather within the first week. Water clarity in the ponds has varied from gin clear in the Boathouse Pool to slightly discoloured through the rest of the system. Changing wind patterns have also had an influence with anything from a fairly mild SW breeze to a fairly steady and very cold easterly. Those anglers with the best results have responded to these conditions and generally tried several different pegs and/or pools. On the Boathouse Pool, Ian Barlow returned 15 fish with the best one a fine specimen estimated at 12lb-plus. James Smith and M. Will enjoyed an excellent day’s sport, returning 15 fish and 12 fish respectively on a catch/release ticket. Best results were on fairly small flies (size 16 or 18) or Bloodworm patterns. A couple of fish were taken on dries, which is always a positive sign. The Burnside Pool has generally responded better to Buzzers fished on a midge-tip line or to Squirmies/Apps fished beneath a ‘bung’. Gordon Dickson, Scott Watson, George Birse and Alan Thomson returned 8 fish each in relatively short fishing sessions. Frank Sherriff returned 15 fish on the Bankside Pool on dry flies despite a cold easterly breeze and Nick Soave took 6 fish for a combined weight of 13lb. Dry flies and black/green lures or Buzzers produced the best outcomes. On the Woodside Pool (any legal method) Powerbait fished fairly deep (1.5 to 2.5m) beneath a float has, as usual, been the method. On Tuesday five anglers landed 12 fish for a total of 22.50lb. Thursday, Friday, Saturday, Sunday 8am to 8pm. This week’s catches included Alex Wilkie with 5 fish for 17lb 8oz including 5lb rainbow and 4lb 8oz gold, plus 6 released; Andy Duffin, in three visits, 5 for 17lb 4oz including 4lb rainbow and 2 browns, plus 13 released; Danny Doherty 5 for 14lb, plus 1 released; Marius Botezatu 4 for 13lb, plus 8 released; Charles Findlater 3 for 9lb; Robert Smith 2 for 6lb 8oz, including a gold; Blair Fergus 2 for 6lb; Alex Botezatu 2 for 5lb 4oz, plus 2 browns released; Eric Mair 4lb 8oz rainbow; George Dobbie 4lb gold; Gareth Mair caught and released 5; Gary Dunsmore caught and released 4; Nick Wainwright caught and released 4; Dean Ritchie caught and released 4. Several other anglers caught between 1 and 3 fish and either kept or returned them. Superb week’s fishing yet again and 42 anglers caught 191 fish of which 168 were safely released. Fish have spent much of the week on the top, except on bright breezy, sunny days, but as soon as it clouded over, back they came to the surface. Restock on April 3 really got the resident fish moving and most anglers enjoyed great sport. White lures, Damsels, Buzzers, Blobs, dries and Montanas all worked well. The Troutmasters fish-off took place on Sunday and despite the awful weather (cold and rain), we are pleased to congratulate Martin Smith for winning with 12 fish. Bill McIlroy came second with 9, Danny Drain third with 4, and Richard Winser fourth with 1. A great atmosphere with everyone enjoying the event, so thank you for coming. A week of predominantly easterly ‘cool’ winds still produced good returns as continuing buzzer hatches dominated the trout’s menu. However, sport to dry flies was also successful, especially during the afternoons. In flat calm conditions boat fishing was ‘light’ as is usual for this time of year, but some determined souls who ventured out were rewarded with good returns with the most effective tactics in these conditions being floating lines and nymph patterns fished from anchored boats. On Sunday 7th Blithfield hosted 2 bank matches – one for Alex Booth Flyfishers whose rod average, based on declarations, was 2.56. The winner was Ian Footman with a total (including time bonus) of 19lb. The other was for Derby Flyfishers whose rod average was a very creditable 5.8 with winner Clive Wilkins releasing 11 fish. Notable returns this week include on 1st April for season permit holder Peter Jeffries with 10 fish caught from the South Lake banks, all on white Fritz. On the 3rd season permit holder John Davies reached double figures with 10 fish from the banks on Claret Buzzers with visiting rod Mike Smith also claiming double figures with 13 fish. On the 4th Messrs Savage and Ford once again found the fish with great tactics using Diawl Bachs and Cormorants to excellent effect with 24 fish and 17 fish respectively from the banks of the ever-productive South Lake. On the 5th visiting rods Messrs Cotterill and Wilson paired up in a boat and, using Diawl Bach and Damsel patterns, recorded a boat total of 25 fish, while on the same day visiting rod Graham England returned a total of 16 fish from the banks with Cormorant and FAB patterns proving useful. Another visiting rod, Richard Meigh, recorded 10 fish from the banks on Saturday 6th as the South Lake continued to fish incredibly well. The North Lake is currently closed to non-season permit holders until May 1 but the sport on the South Lake can be enjoyed by all. 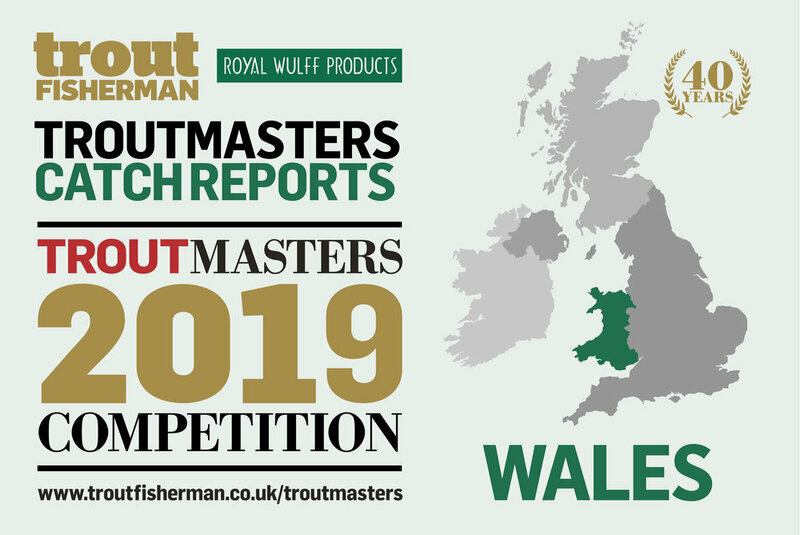 Blithfield is once again a Troutmasters water in 2019 – entry forms are available from the Angling Office and from the Boathouse. A quick reminder that the Angling Office closes at 10.30am on Saturdays (as it did last year). Visiting anglers will need to see the duty bailiff across the dam at the boat house after this time. Best areas: Old Man's; Ten Acre Bay; Mary Lou's; Dougie's; Concrete Bowl. Best dries: Shipman's Sugar Lump; Sedge. Best lures: Cat's Whisker; black and green lures; Montana; Bloodworm; Olive Tadpole. Best nymphs/wets: Montana; Black Buzzer; Diawl Bach; Claret Buzzer. Best fish: 6lb blue trout caught on a Diawl Bach from the South Lake bank by Terry Dallaway. The current rod average is 4.65. For the week April 1 – 7 the 169 anglers caught 959 fish of which 779 were returned. Best fish 5lb 14oz Peter Sharples, Corby, black lure, boat; 5lb 11oz Alan Rennocks, Kettering, Black Buzzer, boat; 5lb 10oz Peter Sharples, Corby, black lure, boat; 5lb 8oz Pete Jinks, Peterborough, Black Buzzer; 5lb 8oz Mr Brockman, boat; 5lb 6oz Roly Stanford, Finedon, Damsel, boat; 5lb 6oz Luke Maylin, Desborough, Tequila Booby, boat; 5lb 5oz Ray Brown, boat; 5lb 3oz Neville Silver, Godmanchester, Orange Blob, boat; 5lb 2oz Dave Rowell, Peterborough, Black Buzzer, boat; 5lb 2oz Darren Oram, Aldwincle, White Snake, boat. Boat anglers had the biggest bags and largest fish last week with many fish feeding in open water. The fish are stuffing themselves on mainly olive buzzers with a few black. Most are around size 14 but a few larger ones are starting to hatch. At the lodge end the boats are fishing buzzer pupae imitations deeper at 8-12 foot deep with good results. In the west arm the fish are much higher with the washing-line the preferred method. Bank anglers covering plenty of water are finding spots where the fish are feeding in range during the day. Mr Bradbeer did a couple of circuits of Elinor on Saturday using small Olive Buzzers and caught 18 fish trying places that often get overlooked. As long as the wind doesn’t blow too hard the famous Elinor evening rise started last week. Shipman’s or CDC Buzzers did well along with Crunchers. Water temperature is an ideal 9.5C and numerous anglers have commented how hard the fish are fighting. Best bank areas are gravel bar, east arm, coarse bank. Best boat areas are west arm, east arm, dam. Best patterns Black or Olive Buzzer, Olive Cruncher, Red Diawl Bach, Candy or Tequila FAB, Olive Shipman’s, white/green lures. On Sunday April 7 Forester Fly Boys had 5 boats. 10 anglers caught 57 fish with Buzzers, Damsels, Blob/FAB taking most fish. Competitors killed 3 fish then catch & release. The bigger fish came on the feed later in the match and had to be returned (thankfully!) Heaviest 3 fish bag: 1. Ian Ashby 5lb 12oz; 2. Colin Forrester 5lb 10oz 3. Paul Mortimer 5lb 9oz; Most fish: 1. Paul Mortimer 12; 2. Mike Edwards 10; 3. Scott Bowman 9. Sunday May 5th, Geordie Mountford Boat Pairs. Open to everyone. A memorial match to commemorate a superb fly-tyer and all round top bloke. You fish with your partner. 12 fish limit for the boat. 9am - 4pm. Entry fee including fishing permits £70 per pair. Richard Winser has kindly supplied a stunning trophy for the winners along with medals for the top 3 pairs. Tackle prizes will also be on offer. Come and fish a friendly competition at peak buzzer time! Sunday May 19th Elinor is holding a heat of the Scierra Pairs. Entry forms available at Elinor or www.scierrapairs.co.uk One in four pairs will qualify for the Grafham final on September 8th. Another mixed bag of weather this week, with windy and wet conditions during the beginning part of the week, and dry but cooler conditions as we moved into the later part of the week. Despite the weather we have seen some impressive hatches and some remarkable bag numbers. Some great success has been achieved from using small dries or emergers along with Buzzers throughout this week. The Oddfellows angling group visited Thrunton on Sunday, most of the members landed fish and everyone enjoyed their day’s fishing. Congratulations to Jim Tuck who won the Troutmasters fish-off on Saturday; a total of 8 anglers fished and landed 92 fish between them making a rod average of 11.5. David Wilson released 5 fish to Long Crag using Griffiths Gnats and Buzzers, enjoying his day. Kevin Stone also released 5 to Long Crag using a Dawson’s Olive and Buzzers. David Kay from Morpeth had two ‘excellent’ 6-hour sessions on Coe Crag using dries, safely returning 30 fish. Jim Lumsden had a ‘good session’ returning 8 fish to Long Crag using a Cormorant. Chris Nichol from Newcastle had a ‘couple of excellent days’ fishing’ landing 28 fish including two double figured fish; all caught using Apps’ Bloodworms, Buzzers and emergers. Josh Piper from Pegswood safely returned 36 fish to Long Crag using dries, during his two visits this week. Lewis Hirst from County Durham landed 14 fish from Coe Crag during his first visit to Thrunton, caught using Apps’ Bloodworms and Zonkers. John Williams from Morpeth safely returned 9 fish to Coe Crag during his 4-hour session using Buzzers. Ray Wood from West Woodburn had a ‘very good day’ landing 8 fish between both lakes using Apps’ Bloodworms and Buzzers. Willy Emery from Newbiggin returned 12 to Long Crag using Buzzers. Marc Cromer returned 11 to Long Crag with Blobs and Bloodworms. Mick Brown from Bedlington returned 20 to Long Crag on Buzzers saying ‘it’s as good as it gets’. Paul Jacques from Alwinton returned 7 to Long Crag using Buzzers and Apps’ Bloodworms. Tony Rowley released 13 to Long Crag on Buzzers, over his two visits this week. Guy Nicholson and John Cowell returned 25 fish between them on the boat, using Bloodworms, Buzzers and dries. Fly box: Buzzers, dries, emergers, Apps’ Bloodworm, Blobs, Dawson’s Olive and Cormorants. Open daily 8.30am to 8pm. Monday and Saturday 5pm close. Long Crag lake will be closed on Saturday April 13 for a club booking, Coe Crag Lake will remain open as usual. Apologies for any inconvenience caused to our regular anglers. 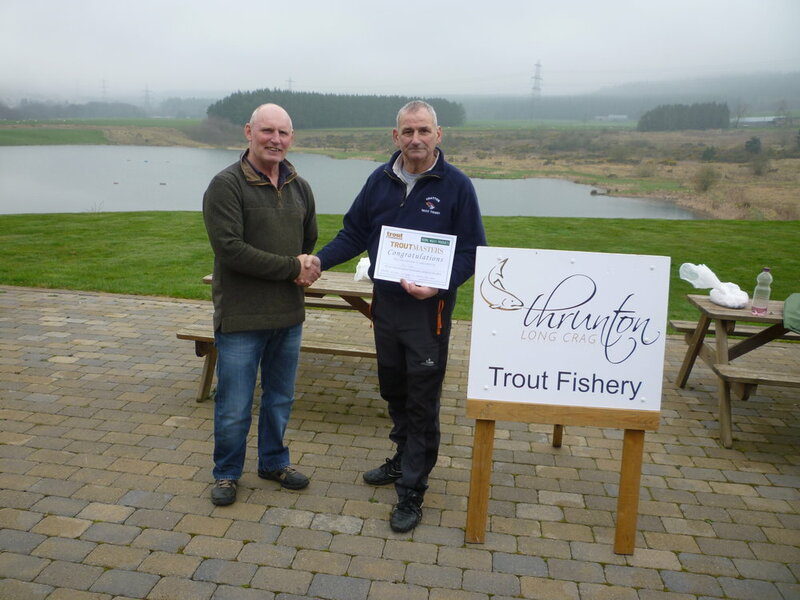 Jim Tuck (right), winner of the Troutmasters fish-off for Chatton which took place at Thrunton. There was a cool breeze for most of the week, but despite this the wa-ter temperature rose from 6C to 8C. Water clarity remains excellent which means that the goldies can be seen cruising around the ponds. Over the course of the week the fish were to be found at vari-ous depths from around 4 or 5 feet deep right up to about 2 feet below the surface. They were also to be found in various different areas of the pond with the Island, Far Bay and Dam all being the favourite spots at different times. A few more browns were hooked this week and the tigers continue to give excellent sport. A good number of fish in the 4lb to 6lb range were landed this week including rainbows, golds, tigers and browns. The usual lures are still taking a good number of the fish but many were attracted by Snatchers, Crunchers and Diawl Bach, with Buzzers also catching a few. The Fishery is open 8am to 8pm. George Dobbie caught 4 fish for 17lb including 6lb rainbow and 4lb brown, plus 1 released; Colin McLean 2 tigers for 9lb 4oz; Julian Rey 2 for 9lb including 4lb 12oz tiger and a gold; John Sneddon 2 for 8lb 12oz including 5lb 4oz gold; Ian Whitfield 2 for 8lb 4oz including 4lb 4oz brown and 4lb 4oz tiger; Davy Quinn, in two visits, 6 for 20lb 8oz in-cluding 3lb 12oz brown, 2 golds and a tiger; Danny Doherty 5 for 17lb 4oz including 3lb 12oz brown and a gold, plus 8 released; Jim Spiers, 3 for 12lb 8oz including a gold and a tiger; Brian MacIntosh jnr, 3 for 12lb including 4lb 4oz tiger and a gold; William Sheppard 3 for 11lb, includ-ing 2 golds at 4lb each; Archie Muir 3 for 9lb 8oz, plus 1 released; Bri-an MacIntosh 3 for 9lb 8oz; Eddie McKillop 3 for 9lb 4oz including a gold, plus 6 released; Bob Armstrong 2 for 7lb 8oz including a gold and a tiger; Henry Thompson, 2 for 7lb including a gold; Brian McPeake 2 for 7lb, plus 1 released; Alex Smith 2 for 6lb 4oz; John McKechnie 2 for 6lb 4oz; John McGowan 4lb 8oz rainbow; TJ Falloon 4lb 4oz rainbow; Mike Luti 4lb 4oz tiger; Gary Stewart 4lb 4oz gold; Tam Clark caught and released 10; Gary Waugh caught and released 7; Robert McLean caught and released 7; Colin Clerk caught and released 4 including a brown. It has been another good week’s fishing with 78 fish caught by 30 an-glers, of which 67 were safely released. Thursday was the best day where everyone caught. Fish taking off the top up to 2 feet down. Brian caught 10 fish off the boat on Tuesday using Buzzers and that does seem to be the best method at the moment. Also Damsels, Apaches, Blobs, Black Cat’s Whiskers, Montanas and small black dries worth a try. The Troutmasters fish-off is on Sunday April. The fishery will be open as usual. Cold winds and rain at the start of the month subsided and we enjoyed near-perfect mild, calm conditions during the last week. After a sluggish start the returns soon started to fill up as fish actively moved closely along the banks, feeding avidly on the food being stirred up there. From midweek onwards there were some further buzzer hatches which created increased activity with some aggressive takes being recorded particularly on small Black Buzzers fished on intermediate lines and sink-tips. Some excellent returns this week include – on the 26th for permit holder Barry Turner with 8 fish from the bank at Dougie’s, all caught on small lure pattern. On the 27th visiting rod David Boardman also recorded 8 fish from the South Lake banks whilst on the same day visiting rod Mick Grant returned 9 fish, caught on black & green or black and red lures or Damsel patterns from the bank. On the 28th the improving conditions saw a great number of excellent returns being submitted. Permit holder Jeff Johnson released all 12 of his fish which were caught from the banks on GRHEs; season permit holder Pat Bur-ton recorded 11 fish and declared “It’s great to be back!”. Permit holder Richard Sunderland returned a grand total of 13 fish, again all caught from the banks on green & black lures and small Buzzers; visiting rods Mr Savage and Mr Ford employed Diawl Bach and Fritz patterns to great effect, returning a very respectable 30 fish and 20 fish respec-tivel; visiting rods Russell Lock and Stephen Dalby also enjoyed a keen day’s sport with 15 and 10 fish respectively; and visiting rod Geoff Tomkinson travelled the South Lake banks and, using Tadpole pat-terns in green and black or olive, recorded a total of 17 fish for his ef-forts. The 29th continued to produce some incredible sport for bank anglers with visiting rods again coming out tops. Graham England fished on a 4-hours permit during the afternoon and recorded a total of 20 fish, all caught on his Holo Cormorant pattern; another 4-hours permit angler, Mr Bailey, also returned 20 fish from the banks of the South Lake whilst visiting rod Bruce Burton released all 13 of his fish which were caught from the banks on a green & black Fritz; season permit holder Derek Spilsbury also enjoyed a few hours’ great sport with 11 fish in total. On Saturday 30th visiting rods Alan Snape and Paul Schonau enjoyed some great buzzer and nymph sport recording 7 and 9 fish respectively from the banks whilst Messrs Murphy and Cotterill returned a total of 21 fish to their boat on the South Lake. Permit holder Terry Dallaway recorded the best fish this week, – a 6lb, naturally grown-on, overwintered blue which was caught from the bank on a Diawl Bach and was safely released back into the water. 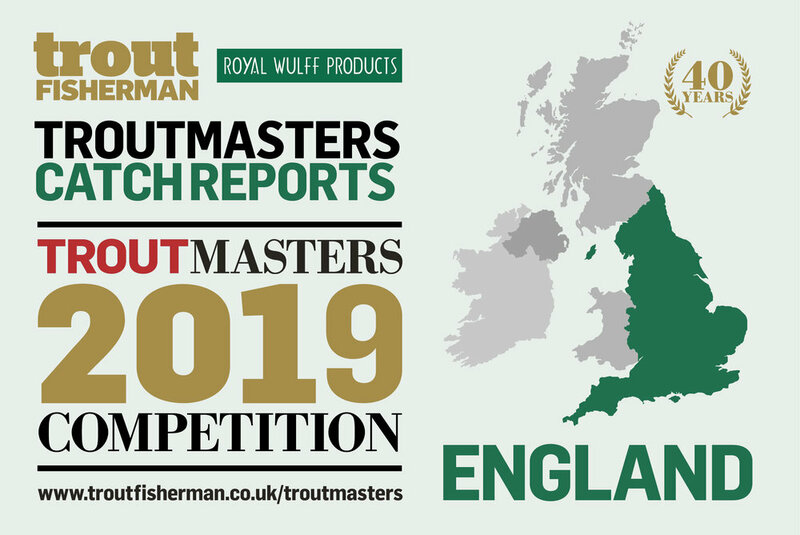 Blithfield is once again a Troutmasters water in 2019– entry forms are available from the Angling Office and from the Boathouse. A quick reminder that the Angling Office closes at 10.30am on Satur-days (as it did last year). Visiting anglers will need to see the Duty Bail-iff across the dam at the Boat House after this time. Best lures: Cat's Whisker; black & green lures; Montana; Bloodworm; Olive Tadpole. Best nymphs/wets: Montana; Black Buzzer; Diawl Bach. The current rod average is 4.45. For the week March 25 – 31 the 259 anglers caught 1033 fish of which 905 were returned. Most bank areas are holding fish while boats doing well in west arm, east arm, and dam. Best patterns are Black or Olive Buzzer, Damsel, Bloodworm, Tequila Blob, Hare’s Ear, Red Diawl Bach. A busy couple of weeks at Elinor. On warmer days there have been some great buzz-er hatches with sizes ranging from 16s - 10s. Bank fisherman found it more difficult on bright days in the clear water but had good sport in overcast light winds. The west arm is holding big numbers of fish with washing-line the best method over the shallower water. The rest of the lake has seen fish feeding deeper with Damsels and Buzzers fished 8- 12 foot down getting the big bags. On most evenings there has been an evening rise to small hatching buzzers. If the wind drops there was a spectacular rise. Small Shipman’s or CDC in darker shades proved effective. On March 30 – 31, 50 anglers fished the Iain Barr World Bankmasters singles event with competitors from Belgium, Norway and Finland up against UK anglers. The whole lake was pegged with anglers fishing 11 sessions of 30 minutes and doing a complete circuit. Bright sunshine and calm conditions prevailed for most of the match. Dan Swales put in a fantastic performance to catch 15 fish off 9 of his pegs using Dam-sels on an intermediate or a chamois worm under an indicator to scoop £1100 with the top 10 all receiving cash. Sunday 31st saw 17 pairs compete. The wind changed to a brisk NE with an extra three layers of clothing required. 10 sessions of 30 minutes. Damsels, buzzers and assorted Worms fished deep and slow did the damage. Warm and windy conditions this week, size 14 and 16 Buzzers have proved successful throughout this week, other anglers picking up fish on size 20 Olive and Black CDC Shuttlecocks. Despite anglers finding small flies to be most productive, a few anglers have tempted some fish to Daddies. The changeable wind direction has made it slightly challenging this week, however those who persisted have enjoyed some good sport. A nice brown was landed by Brian Lillie this week from Long Crag, it was estimated at 14-15lb. Members of The Cram-lington Renegades visited this weekend, who all caught fish and thor-oughly enjoyed their 8 hour session. Alec Harvey from Cramlington had some ‘great sport’ safely returning 15 fish to Coe Crag during a 6 hour session using Buzzers. Greg John-son returned 12 fish in 4 hours fishing from the boat on Long Crag, caught using Buzzers and lures. Trevor Wadds from Longframlington released 16 fish between both lakes using dries. David Dodds released 7 fish to Long Crag using CDC Hoppers, his best fish was estimated at 8lb. John Woodford from Alnmouth released 11 fish to Coe Crag using Buzzers. 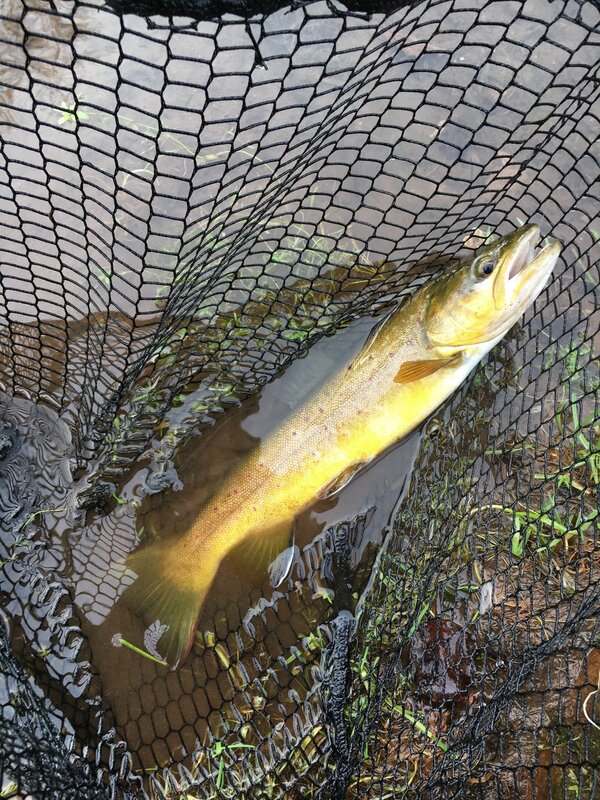 Julian Bales from Wooler released 23 fish over his two visits this week all caught using dries. Spike Millican from Blyth returned 9 fish to Long Crag using both dries and wets. Chris Nichol from Gosforth had some ‘great fun’ safely releasing 9 fish between both lakes using Apps’ Bloodworms. Keith Laidler from Chester-Le-Street also landed 9 fish between both lakes using lures. Jim Burtle from Newcastle had 8 from Long Crag and 4 from Coe Crag using size 20 CDCs. Brian Bailes had a ‘very good day’ releasing 7 fish to Long Crag. Kieran Holliday re-leased 16 fish to Long Crag using Wicked White Buzzers. Brian Lillie released 10 fish to Long Crag using lures, including a estimated 15lb brown. Mick Brown from Bedlington had a ‘splendid day’ fishing size 14 emergers, landing 19 fish between both lakes. Tony Rowley from North Shields safely released 17 fish to Long Crag using Buzzers over his two visits. Ken Glenton from Ashington safely released 25 fish over his two visits this week, caught using Buzzers, dries and Chamois. Fly box: Buzzers, CDCs, Apps’ Bloodworms, Hothead Damsels, Hop-pers, emergers and lures. Fishery open daily 8.30am to 8pm. Monday and Saturday 5pm close. Coe Crag Lake will be closed on Saturday April 6 for a Troutmasters fish-off. Coe Crag Lake will also be closed on Sunday April 7 for a club booking. Long Crag Lake will remain open as usual on both of these dates. Long Crag lake will be closed on Saturday April 13 for a club booking, Coe Crag Lake will remain open as usual. Apologies for any inconvenience caused to our regular anglers. Edward Collier-Webb (5) and mum Sharon, with his first catch, taken on a Damsel at Bigwell fishery. Good weather this week with temperatures averaging 11 degrees and the pools cool and clear. The fishing has been exceptional with quite a few catch and release anglers catching their bag of 10 fish and catch and kill anglers all taking their required fish. What a great weekend for the younger generation which began with young Alex Cotterill, age 8, visiting with his grandad Gary Tucke. Alex caught his first ever fish, taken on a Squirmy Worm and entered into Junior Troutmasters. Lewis Thomas also caught 2 rainbows which he took on Bloodworm. Lewis was with his grandad Dai Thomas. Five-year-old Edward Collier-Webb also recorded his first catch while fishing a Damsel under a sight indi-cator two feet down and with a slow retrieve. Edward’s catch has also been entered into the junior Troutmasters competition. Our more senior anglers were also having a great week with John Bur-ton catching his bag limit on catch and release, his most popular pat-tern was a White Egg fly with a green spot. Jason Williams also caught his bag limit on catch and release. Also on catch and release were Keith Fenton, Bob Calder, John Burton, D. Thomas, Gary Tucker, Ad-am Price-Hunt, Ashley Clarion, Llwyd Johnson, Brent Johnson, Mike Batty, Lloyd Isgrove, Lyndon Harris, Carl Williams, Mick Smith, and Phil Roe. On catch and kill tickets were Brent Johnson with 2 fish, Zach Williams 3, Terry Hill 3, R. Mackenzie 3, A. Mackenzie 2, Mick Fahy 1, Jean Fahy 1, Gary Whitlock 1, George Parfitt 4, Alan Brunt 2, Graham Jere-miah 2, Hugo Perks 4, and John Butterfield 5. Popular flies this week have been, Blue-flash Damsels, Cat’s Whiskers, Black Gnats, Apps’ Bloodworm, Buzzers, Klinkhamer, Peasant Tail Nymph and Egg Flies. Bigwell is open every day from 7.30am. It has been an excellent week and it was great to see so many new anglers at the fishery. Many caught in double numbers and Stan Brown caught a beautiful 5lb rainbow on Tuesday on a White Apache. For the week 125 fish were caught by 41 anglers. Fish are showing all over the lake so both the banks and boats have had good results. Best methods are Black Hawthorns, Apaches, Squirmy Worms, Black Cat’s Whiskers, Montanas and Diawl Bachs and fish are in the top 5ft. Next restock is just before the Troutmasters fish-off which is on Sunday April 7. The fishery will be open as usual. Weather is expected to be good and ideal for fishing. Season tickets are now available. If you don't want to wait until September 1 for unlimited visits Blackdyke will make the offer available for April, May and June, 2019 for just £52 a month. Contact Niki on 07795 571371. This pro rata offer is only valid until the end of this season, June 2019). Normal commencement September 1, 2019 to June 30, 2020. Heavy rain and strong winds heralded the start of the 2019 season sending waves crashing over the dam wall for the first 3 days. This, combined with a considerable influx of cold, coloured water from the rivers produced a tough start for some. During the following days the water clarity improved and on warmer, less windy, days fishing improved and some good bags were recorded. Towards the end of the week in flat calm conditions large numbers of rising fish were seen all across the South Lake feeding on terrestrial cow dung flies and the start of the buzzer hatches. Some early chancers have caught on dry flies but the majority of fish are responding well to Montana, black and green lures, small Black Cormorants and Cat’s Whiskers on intermediate lines. A steady retrieve is certainly a good tactic to employ in these early days of spring with fish closer in to the banks and feeding avidly. The initial pre-season stocking of 4,000 fish and a continued weekly stocking policy, combined with a significant head of resident fish, should ensure improving returns if the conditions remain favourable. Notable returns this week include on the 19th for permit holders Derek Cope and Mick Cope with both recording fish of 4lb-plus from the South Lake banks. Mick just sneaks best fish of the week with a 5lb rainbow caught on a Cat’s Whisker and safely released. Permit holder Alan Deakin recorded a total of 7 fish from the South Lake banks, all caught on Black Buzzers and lures. The 20th saw further improvements with season permit holder Peter Jeffries returning 15 fish – all caught on small white lures from the South Lake banks. The 21st was opening day for non-permit holders and proved fruitful for Bruce Burton and John Graney with a total of 27 fish to their boat in near perfect conditions, again black & green lures proving the top patterns. On the same day season permit holder Alan Miles bagged up with his 8 fish limit from the South Lake banks and visiting rod G. England found that a black & green Cormorant was a perfect choice, recording 7 fish in total. Winds swinging to the northwest on Friday and Saturday saw slightly cooler conditions but season permit holder Phil Sadler still managed a decent 6 fish from the banks and season permit holder Barry Walker recording 7 in total. 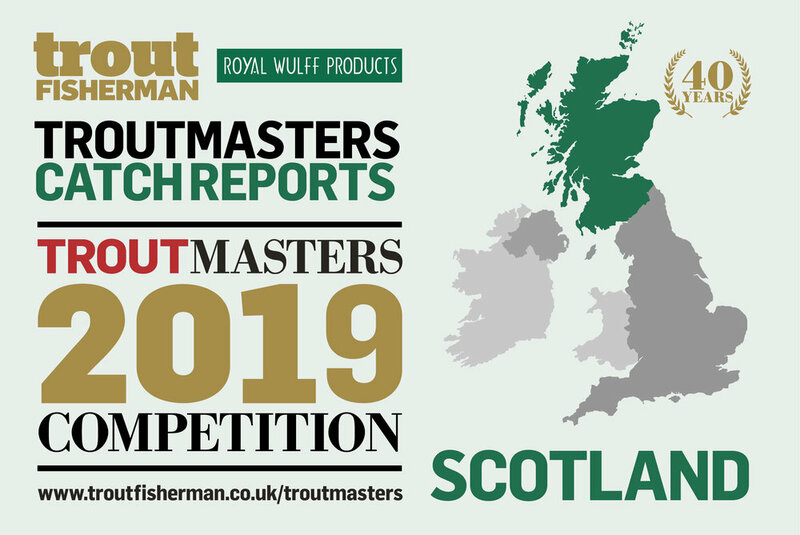 Blithfield is once again a Troutmasters water in 2019. Entry forms are available from the Angling Office and from the Boathouse. Best lures: Cat's Whisker; black & green lures; Montana. Best nymphs/wets: Montana; Black Buzzer. Best fish: 5lb rainbow trout caught on a Cat's Whisker from the South Lake bank by Mick Cope. The current rod average is 2.46. For the week March 18 – 24 the 270 anglers caught 1231 fish of which 914 were returned. On Saturday March 23 the Invicta Fly Fishers held their Norman Shipley Memorial bank match. A bright day with an overnight change in the wind direction made bank fishing difficult and the 20 anglers caught 53 fish. Milder weather and some slightly more settled conditions, resulted in some excellent bags being recorded. At the beginning part of the week there were some very impressive hatches, where size proved to be key when matching the hatch. However when the wind increased, fish would move to feeding subsurface on buzzers, spiders and small nymphs. CDCs and Black Gnats accounted for the majority of the fish caught on the surface this week. This week we held our Troutmasters fish-off, it was a 6-hour competition on Long Crag. 10 anglers fished, 2 of which were fishing in the junior section attempting to qualify to fish the Troutmasters UK junior final at Thrunton in July. 64 fish were caught making a rod average of 6.4. A big well done to Phil Green who qualified for the seniors, and also to Ryan Foggon who will be fishing for Thrunton during the Junior Final. Thank you to our marshals; Jim Foggon and Andrew Lister for helping on the day. Members of the North East Ladies angling club, visited Thrunton on Sunday all thoroughly enjoying their fishing session. The Ashfields from Brampton all had a ‘great’ 3 hours landing 12 fish between three anglers, all caught using Buzzers. Blyth angler Reg JAcobs landed 23 fish between both lakes using Buzzers and lures, also having three ‘great days’. Trevor Wadds from Longframlington safely returned 23 fish to Long Crag using dries over his two visits this week. Alan Morton from Gosforth released 10 fish to Long Crag, all caught using Buzzers. Kevin Dinning had an ‘electric morning’ returning 14 fish between both lakes using Buzzers and Spiders. Newcastle angler, Jim Burtle had a ‘great day on dries’ releasing 12 to Long Crag using Yellow Owls. Ken Glenton had a ‘good day’ using Black Gnats and Buzzers to release 28 between both lakes over his two visits. Andy Gorman from Morpeth had a ‘good afternoon’ landing 8 fish between both lakes using an Olive Cruncher. Brothers,Corey and Mitchell Dow kept 4 fish each, one bag total at 14lb the other at 16lb. Mitchell had the best fish weighing in at 6lb 15oz, all caught using Fritz. Peter Kerr from Longhorsley had an ‘outstanding afternoon’ landing 12 fish in 4 hours using a Black Emerger. P. Jaques from Alwinton landed 18 fish between both lakes using CDCs. Derek Hare had a ‘brilliant day’ fishing small nymphs and catching 19 fish between both lakes. Derek and David Todd both landed 12 fish each from Long Crag using dries and nymphs, most of their fish were in the region of 5-8lb. Fly box: Buzzers, Spiders, Black Gnats, Yellow Owls, Crunchers, Fritz and Hothead Damsels. Open daily 8.30am to 6pm. Monday and Saturday 5pm close. Despite the extreme windy conditions last week our anglers still came through the gates. On Saturday Steve Boyle and S. Finch took 5 fish each on their catch and kill tickets, under very windy and wet condi-tions. John Lyall fished on the same day with his sons Chris and Paul. John took 2 fish, Chris (fly-fishing for the first time) caught an impres-sive 4, and Paul took 5, catching mainly on Green Damsels and Pheasant Tail Nymphs. On Sunday George Dickman caught 5 fish and lost 4, 1 was taken on a Diawl Bach suspended 18 inches down under a sight indicator, the others on an Orange Blob and Yellow Buzzers. Dave Tapper landed 2, Chris Cowlson 3, Paul Sanders 3, Richard Morgan 4, and Dale Llewellyn 2. Tuesday this week saw one of our best fishing days for a while with rods bending over on all pools. Harry Webb caught his second fish on a Green Montana, and Hugo Perks caught a beautiful 3lb rainbow from the Lower Lodge Pool taken on a Red Klinkhamer and went on to catch 3 more using his Allcocks Marvel split cane rod that his father bought for him back in 1965. Veteran an-gler Basil Freeman, still fishing at the grand age of 89, caught his usual 2 for the table on a Green Damsel. Graham Jeremiah landed 2 fish on Squirmy Wormies and Phil Rees landed 3 mostly on Cat’s Whiskers and Chamois fly, Whilst retrieving one of his fish Phil’s leader became entangled with a previously snapped leader still attached to a fish, so he managed to land 2 fish using only one hook. On catch and release this week and catching their bag limits were John Burton, Richard Tre-main, Keith Fenton, David Lee, Mick Foster, Dennis Millward, Ian Childs, Lewis Jones and Chris Williams. Popular flies this week have been Klinkhamer, Pheasant Tail Nymph, White Cat’s Whiskers, Whick-am’s Fancy, Black Gnats, Apps’ Bloodworm, Green Damsel, Yellow Buzzers, Montana and Egg flies. Bigwell is open every day at 7.30am. Despite the weather with winds gusting at 50mph over several days, fishing actually hasn't been all that bad. There were 10 anglers over the week with 44 fish caught. Martin Cole landed 17 on Friday using small Black Hawthorns. Other good methods were Squirmy Worms, Black Cat’s Whiskers, black lures and Diawl Bachs. The next restock just before the Troutmasters fish-off. Weather is set to improve so fishing conditions are expected to be good. The Troutmasters fish-off is on Sunday April 7 and the fishery will be open as usual. Tequila Blob/FAB, Candy Blob, Red Apps, Red Diawl Bach, GRHE, Black Buzzer, Damsel. Another windy week with the boats only able to go out on Monday and Sunday. A combination of sun and wind made the fishing tricky but there were good catches to be had with plenty of cloud cover. This week looks perfect with fish guaranteed to be feeding on buzzers. Despite the storms the water remains clear. If anyone is free to help marshal the World Bank Masters competition on Saturday March 30 please contact the fishery on 01832 720786. You will be signing competitors scorecards when they release a fish and ensuring they are using debarbed flies. Fishery open daily 8.30am to 6pm. Monday & Saturday 5pm close. Long Crag lake will be closed for the Troutmasters fish-off on Saturday March 23, Coe Crag lake will remain open as usual. Apologies for any inconvenience caused to our regular anglers. Coe Crag lake will be closed Friday March 29 for a corporate event. Long Crag lake will remain open as usual. Apologies for any inconvenience caused to our regular anglers. Adam Price-Hunt with the brown trout caught from Bigwell’s stream. The earlier part of the week saw the Lodge pools highly coloured with water from the stream. Oliver Birch and Chris Laidlaw successfully caught while trying their hand in the Gin Pool, but with cold winds and sunny intervals it was challenging. Lionel Davies caught his 3 fish on White Minkies and Cat’s Whiskers (2 from the Lodge Pool and 1 from the Gin Pool). Keith Fenton took 2 fish, Alan Brunt 2, Rob Boswell 1 and Sinead Collins 1. Adam Price-Hunt caught his bag limit including a beautiful brown trout from the stream on a Pheasant Tail Nymph. Midweek the Lodge pools were still slightly coloured but clearing well. Keith Fenton landed 3 fish on his catch and kill ticket on Apps’ Bloodworms, John Burton caught his bag limit of 10 fish from across all pools. David Fletcher landed 8 including 2 blues on Egg flies and Black Tadpoles. 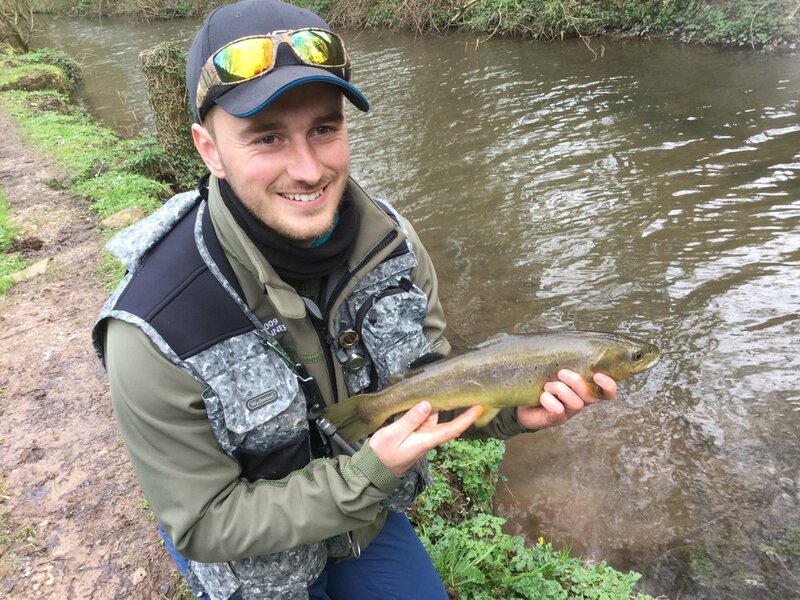 Adam Morgan from Bristol caught 4 rainbows and 1 tiger trout taken on a Black Cruncher. This fish led Adam a merry dance around the Lower Lodge Pool. Phil Roe landed 6 trout on Egg flies, White Minkies and Tadpoles from the Lodge pools. David Schewitz tempted 3 from the Lodge pools. The blustery winds continued all week but if you could put up with this and the rain and hail, there was some excellent fishing on the cards. What a great weekend with 69 anglers landing 179 fish. Fair play to those anglers who managed to find the depth, flies, retrieve, etc and hammered it. It wasn’t easy by any means for all but some lads got it right at the right time and had a great time. Top rods were Steven Ramsay with 25 fish, Neil Kelly 17 and Jim Moncur 9. Lots of 2s, 3s, 4s and 5s recorded but still a couple of blanks. Top weights were Bernard O’Donnell - 12lb 1oz, Rob Buie -12lb 1oz, Robert Pollock - 10lb 12oz, Brian Cairns- 10lb 12oz, Steven Ramsay- 10lb 12oz and 9lb, Dave Hanlin -10lb 10oz and 9lb 8oz, Dale Cassidy- 9lb 9oz, Chris Collins - 9lb 9oz, Callum Cochrane - 9lb 8oz and 9lb, Stephan Lee - 9lb, Ben Bosch - 8lb 5oz, Jim Moncur - 7lb. Top flies were Ally McCoist, Diawl Bachs, Cormorants, FABs and Buzzers. To say the weather has been bad for business is an understatement. Consistent high winds all week made conditions almost impossible to fish. Saying that, a few anglers braved the weather and if they fished deep, they had results. More bad weather predicted this week so we will be restocking next week as long as the weather improves. The brand new website at www.blackdykeflyfishing.co.uk has been launched. New season tickets available that offer unlimited fishing, see website for details. See Facebook for a competition that could win you a free day’s fishing too. For the week March 4 – 10 the 85 anglers caught 441 fish of which 378 were returned. Wet and windy weather kept many anglers away with boats not being able to go out on 3 days. Despite the wild conditions the water remains clear and anglers who did fish had good sport on most days. There have been plenty of fish in the sheltered areas so there is no need to cast into the wind. Despite only 63 fish removed last week there is a further stocking on Friday to keep up the excellent start to the season. Best fish 7lb 14oz Marius, Slough, Black Snake, float-tube; 6lb 9oz Chris Redhead, Whittlesey, Black Buzzer, boat; 6lb 4oz James Stuart, Kibworth, Damsel; 6lb 4oz Chris Redhead, Whittlesey, white/green lure, boat; 6lb 2oz Chris Redhead, Whittlesey, Tequila Booby, boat; 5lb 12oz Mal Broughton, Grantham, Ally McCoist, boat; 5lb 10oz Steven Wright, Cardiff, boat; 5lb 8oz Neville Silver, Godmanchester, Damsel; 5lb 5oz Chris Selby, Yaxley, Olive Snake; 5lb 4oz Clive Trundle, Silverstone, Damsel; 5lb Mal Broughton, Grantham, Ally McCoist, boat; 5lb Chris Selby, Yaxley, Pitsford Pea. Best bank areas are lagoon, boat bay. Best boat areas west arm, dam, boat bay. Best patterns Damsel, small black/green or white/green lures, Bloodworm, Hare’s Ear, Red Diawl Bach, Black Buzzer, Olive or Black Snakelet. If anyone is free to help marshal the World Bank Masters competition on Saturday March 30 please contact Ed on 01832 720786. You will be signing competitors scorecards when they release a fish and ensuring they are using debarbed flies. There are still places available for the Iain Barr World Bank Masters. Saturday March 30 is the individual competition. Sunday March 31 is the pairs match. Thousands of pounds in cash and tackle up for grabs. All anglers are welcome to enter this catch & release event. Rules and entry forms are available at Iainbarrflyfishing.co.uk or at the Elinor lodge. It has fished well at Thrunton this week despite the mixed weather. The changeable weather forecast put some anglers off, however those who braved the conditions were rewarded with some good sport and even a few double figured fish this week. We have seen two hatches of olives this week, which was nice to see despite being at the beginning of March. Anglers have been catching fish at all levels and on various different flies, from dries to lures. Thrunton hosted the TEFF semi final on Sunday, where 24 anglers fished. • John Tait from Belford returned 8 fish to Long Crag including 2 double figured fish, all caught using Cat’s Whiskers. • David Kay from Morpeth had a ‘good day’ on Coe Crag returning 18 fish using various lures, David also landed a beautiful double figured brownie. • Blyth angler, Rodney Burn also had a ‘good day’ fishing lures on Coe Crag, landing a total of 9 fish. • Mark Harrison landed 9 fish from Long Crag, while practising for the TEFF semi-final. • Brian Lillie had a good 5 hour session, landing 8 fish from Long Crag. • Bedlington angler, Mick Brown safely released a total of 20 fish between both lakes using Buzzers. • Paul Pratt from Chester-le-street released 16 fish to Long Crag using Bloodworms, during his practice session for the TEFF Semi final. • Peter Crowe landed 15 fish from Coe Crag over his two visits to Thrunton this week. • Josh Piper from Pegswood released 11 to Long Crag, during his 5 hour session. • Ray Wood from West Woodburn had a ‘brill’ day using Yellow Lures, releasing 8 fish between both lakes. • Newbiggin angler, Willie Emery had a ‘very good’ day fishing Buzzers landing 8 fish from Long Crag. • Alec Harvey from Cramlington had some ‘good sport’ while fishing Long Crag releasing 10 fish. Please Note: Long Crag lake will be closed for the Trout Masters Fish off on Saturday 23rd March, Coe Crag lake will remain open as usual. Apologies for any inconvenience caused to our regular anglers. Garry Hunter with his 13lb 8oz Kinross rainbow. Ali Rahdi with 6lb 6oz Kinross rainbow. Fishing has been unpredictable this week with white/green lures, Olive or Black Snakes, Damsel, and various Buzzers all being tried. On the calmer, clear days fish were about 4 to 6 feet down and on the windier cooler days you could see fish rising but methods had to vary and effort much harder. The Troutmasters fish-off is Sunday April 7 and we will be confirming attendance over the next few days. Next restock is late March but plenty of fish to be had. New upgraded website coming soon. For the week February 25 - March 3 the 191 anglers caught 975 fish of which 778 were returned. Best fish 10lb 3oz Steve Loveridge, Kettering, Red Apps’; 7lb 4oz Mark Phillips, Northampton, Bloodworm, boat; 6lb 10oz Ian McClements, Stevenage, Bloodworm, boat; 6lb 8oz Sean Marriott, Market Harborough, Hothead Damsel; 6lb 8oz David Mason, Bloodworm, boat; 6lb 8oz Nigel Cheetham, Thrapston, Black Snakelet, boat; 6lb 6oz Graham Dutton, Market Harborough, Hothead Damsel; 6lb 5oz Graham Dutton, Market Harborough, Hothead Damsel; 6lb 4oz Mr Rowe; 6lb 2oz Ken Nicholls, Farcet, Red Diawl Bach, boat; 6lb 1oz Mel Dunn, Eye, Damsel; 5lb 12oz James Stewart, Kibworth, black/green lure; 5lb 8oz Ian McClements, Stevenage, Bloodworm, boat; 5lb 6oz Darren Oram, Aldwincle, White Snake; 5lb 6oz Chris Selby, Yaxley, Olive Snake; 5lb 6oz Steve Loveridge, Kettering, Bloodworm. Colder conditions meant there were fewer buzzer hatches although some fish continued to rise in the west arm. Best method was a floating line with a Bloodworm or Damsel on the point and a Hare’s Ear or Red Diawl Bach on the dropper with a slow retrieve. Snakes and other large lures did well on the rougher days. Fish are being caught from the whole of the lodge bank. Despite the winds on Sunday the water remains clear. Lots of 4lb-plus fish continue to be caught from boat and bank. Best bank areas are lagoon, dam, gravel bar, shallow bay. Best boat areas west arm, dam, boat bay. Best patterns are Red or Pink Apps’ Bloodworm, Damsel, white/green lures, Hare’s Ear, Black or Olive Buzzer, Orange/Tequila Blob. Mixed temperatures and varied pressures have made fishing slightly challenging this week. However, when the conditions were right anglers enjoyed some 'excellent sport' and some 'nice afternoons'. Small Buzzers, Diawl Bachs and dries have accounted for the majority of the fish being caught, despite other anglers still picking fish up on lures. During the bright and mild conditions at the beginning part of the week late afternoon sessions proved to be most successful. Well done to Thrunton junior Ryan Foggon who landed his personal best rainbow estimated at 5lb. Ryan is hoping to be one of this month’s Troutmasters badge winners. G. Hall from Newcastle had an 'excellent' day, landing 8 fish from Long Crag on a Black Gnat. George Shanks used a Buzzer to safely release 5 fish to Coe Crag, having a 'great day'. Bedlington angler Mick Brown returned 35 fish to Buzzers over his two fishing sessions. Peter Kerr had a 'nice afternoon' fishing small nymphs, returning 5 fish to Coe Crag. Kevin Dinning from Dinnington returned 9 fish between both lakes using Buzzers. Jimmy Drew used a Chamois to land 6 fish from Long Crag. Ray Wood from West Woodburn used a Bloodworm to safely release 5 fish to Long Crag. Longframlington angler Trevor Wadds released 5 fish to Long Crag using Diawl Bachs. Ian Fairgreave from Morpeth safely returned 12 fish to Long Crag during his 5-hour afternoon session. Lee Cartmail landed 7 fish from Long Crag using Buzzers. Mike Mark used a Black Bunny to safely return 5 fish to Coe Crag. Andy Taylor returned 9 fish to Long Crag during his practice session for the TEFF semi-final. Mark Harrison returned 13 fish to Long Crag. Brian Davis released 12 to Long Crag, while also practicing for the TEFF semi-final. Peter Crowe returned 6 fish to Long Crag. Fly box: Diawl Bachs, Buzzers, Bloodworms, Chamois, Black Gnats, FABs and Black Bunnys. Fishery open daily 8.30am to 5pm. Please note: Long Crag lake will be closed on Sunday March 10 for a TEFF semi-final, Coe Crag lake will remain open as usual. Apologies to our regular anglers for any inconvenience caused. Mark Jones with one of his two Blackdyke rainbows. A superb week at the fishery culminating in a great event Sunday, the ATEFF Stillwater qualifier (south). The competitors on the day caught 41 in total but other anglers on the bank also had success. Oliver Jenkinson came first with 8 fish, second was Graham Willis with 4 and third was local angler Joel Bilner also with 4. A special commendation to Lee Cartmail who did a superb job of marshalling, organising and coordinating the event. Damsels, Cat’s Whiskers and Yellow Dancers all did well with Buzzers also in the mix. Alec Urquart had a beautiful rainbow on Thursday coming in at 4lb which he entered into Troutmasters. Mark Jones landed 2 fish on the near side bank on Sunday. We are very proud of the great feedback we had about the quality of fish and the facilities at the fishery and commit to continue to make our fishery a place for a terrific experience. For the week February 18 – 24 the 262 anglers caught 1281 fish of which 954 were returned. Best fish 7lb 9oz John Parker, Cambridge, Cat’s Whisker; 7lb 2oz Paul Laundon, Bedford, Blue-flash Damsel; 7lb 2oz Mel Dunn, Eye, Damsel; 7lb Mr Clay, boat; 7lb Paul Mortimer, Thrapston, Black Buzzer, boat; 6lb 14oz Mick Moseley, Rushden, Red Apps’; 6lb 8oz John Oram, Desborough; 6lb 8oz Mr Hobson, Damsel; 6lb 5oz Steve Owen, Staffs, Damsel; 6lb Adrian Wilkins, Easton, Snake; 5lb 14oz Dean Igoe, Crowland, Hothead Damsel, boat; 5lb 11oz Noel Doran, London, Goldhead Hare’s Ear, boat; 5lb 8oz Bob Symes, Geddington, boat; plus 10 other fish over 5lb. Best bank areas are lagoon, dam, boat bay. Best boat areas west arm, dam, boat bay. Best patterns white/green lures, Olive or Black Snakes, Damsel, GRHE, Red Diawl Bach, Apps’ Bloodworm, Olive Buzzer, Black Buzzer. The great weather continued with another busy week. Although lures fished deep and slow continued to catch, anglers using nymphs in the calm, bright conditions have been doing well. Good numbers of fish are rising to small hatching buzzers although most fish are being taken 4-6 foot down. The water remains gin clear so a fluorocarbon leader is a must. Lots of 4lb-plus fish being caught from boat and bank. There are still places available for the Iain Barr World Bank Masters. Saturday March 30th is the individual competition. Sunday March 31 is the pairs match. Thousands of pounds in cash and tackle up for grabs. All anglers are welcome to enter this catch & release event. Rules & entry forms are available at Iainbarrflyfishing.co.uk or at the Elinor lodge. For a taste of the the fishing last Wednesday at Elinor take a look at YouTube ‘A great February day at Elinor Trout Fishery. Some more settled temperatures, but windy conditions have still provided anglers with the opportunity to be fishing high in the water. Dries, nymphs and Buzzers have all proved very successful this week, however other anglers still taking some good bags on lures fished slightly deeper in the water. This week we hosted the Fritz & Flies winter series finals where 32 anglers competed each day for a share of prize money accumulated over numerous heats fished throughout the winter. During the individual final, 165 fish were caught giving a rod average of 5.2, this allowed anglers to be paid £12.50 per fish caught in the final. David Parker and Ryan Mathews both landed 12 fish each, closely followed by David Neilson landing 11 fish giving him second place and third place went to Trevor Wadds who landed 10 fish. During the pairs final 99 fish were caught, making a rod average of 3. Winners were Gareth Tilley and Alan McPhail who bagged £560 between them. Lee Wilkinson and Conor Metcalfe came second taking £420, third place went to Rob Sharpe and David Neilson who walked away with £280, and finally well done to Davy Kay and Rodney Burn who earned £140 between them. Well done to all of the anglers who fished throughout the weekend, and a thank you to Jim Tuck for organising the event and for the kind donation to our junior fund. Cramlington angler Michael Hall safely released 11 fish to Long Crag over his two visits using dries and lures. Dan Vine from Lanchester returned 9 fish using lures during his 8-hour session on Long Crag. Huddersfield angler Ben Fox used Damsels to return 7 fish to Long Crag. Les Dinsmore from Cramlington landed a total of 6 fish using a home-tied Buzzer. Peter Mathews from Cockfield landed 8 fish between both lakes using various flies. A. Scott also from Cockfield landed 14 fish using Blobs and lures. He also landed two double figured fish, the largest estimated at 18lb from Long Crag. Eric Caisley had a ‘good day’ fishing Suspender Buzzers, landing 6 fish from Long Crag. Gary Hester landed 12 fish over his two visits this week using Buzzers and Bloodworms. Wayne Haddon released 6 fish to Long Crag using a Blue-flash Cat. Trevor Wadds from Longframlington safely returned 11 fish using Bloodworms, Diawl Bachs and Buzzers during his practice session for the Fritz & Flies Final. John Woodford from Prudhoe landed a lovely overwintered rainbow weighing 10lb 12oz from Coe Crag. Wullie Leech landed 6 fish from Long Crag during his practice session also for the Fritz & Flies final, he caught them using lures. Bedlington angler Mick Brown landed 14 fish between both lakes using Buzzers and dries. Conor Metcalfe from Consett used lures and Tinnies to safely release 12 fish between both lakes, while practicing for the Fritz & Flies Final. Fly box: Dries, Buzzers, Bloodworms, Diawl Bachs, Tinnies, Cat’s Whiskers, Blobs and lures. Open daily 8.30am to 5pm. Long Crag lake will be closed on Sunday March 10 for a TEFF semi-final, Coe Crag lake will remain open as usual. Apologies to our regular anglers for any inconvenience caused. The week kicked off to a good start when one of Bigwell’s tiger trout was caught by David Lloyd on a small Black Buzzer. David couldn’t believe the fight this 2lb feisty fish put up, it took him a merry dance around the Lower Lodge Pool, and he then went on to catch his bag limit of 10 fish. Fishing the latter part of the week was extremely challenging with anglers working their way through their fly boxes trying to tempt the fish. John Burton eventually caught his first fish of the day on a Green Damsel then went on to land 5 more fish. Jamie Gough caught 3 on an Epoxy Buzzer with gold holo cheeks. When all around him were failing to catch George Dickman brought 7 fish to the net and lost 7. He caught 2 on dry fly and the rest on an Olive Spider. On catch and kill this week were Philip Rees with 2 fish, Graham Jeremiah 2, Glyn Morgan 2, Emile Etheridge 3, Kirton Gourdie 3, Ossian Gourdie 2, Jim Bladen 1, Nigel Thomas 2, Dave Reaney 2, G. Jones 3, George Parfitt 4, and Tim May 6. On catch and release Adam Wharton caught 1 on a black grub and 1 on a Bloodworm, Tom Gibson 4, Mick Paine 4, Scot Payne 3, Robin Vale 5, Mark Fletcher 1, and Steve Gray landed 4 all on Apps’ Bloodworms fished static under a sight indicator. The two most popular flies catching really well this week have been Apps’ Bloodworms and Olive Spiders. Bigwell is open every day from 7.30am. An excellent week at the fishery. The restock on Tuesday really stirred things up with some really great results. Great to see Iain Barr on our bank guiding/coaching Joel Bilner who will be attending the TEFF Bank Match this Sunday. Ian had 15 fish, all safely released. Morning and afternoon had the best of the action. The week since Tuesday there were more than 130 fish caught. Damsels, Buzzers, Bloodworms and anything olive all working well. TEFF Bank Match this Sunday. For the week February 11 – 17 the 245 anglers caught 1462 fish of which 298 were returned. Best fish 10lb 6oz Mick Roche, Great Addington, black/silver Humungus; 8lb 4oz Chris Redhead, Whittlesey, white/green lure, boat; 8lb 1oz David Chappell, Westoning, Blue-flash Damsel; 8lb Mr Herridge, Essex, boat; 7lb 4oz Paul White, Northampton, Cat’s Whisker; 7lb 4oz Pete Welch, Boston, Black UV Booby; 7lb 2oz Roy Swinfield, Leicester, Black Buzzer; 7lb 2oz Chris Redhead, Whittlesey, white/green lure, boat; 6lb 12oz Sean Roe, Kettering, black/green lure; 6lb 12oz Chris Redhead, Whittlesey, white/green lure, boat; 6lb 9oz Derek Benamore, Finedon, Olive Snake; 6lb 8oz David Chappell, Westoning, Blue-flash Damsel; 6lb 8oz Lazloe Boden, Rothwell, Yellow Dancer, boat; 6lb 8oz Mr Curtis, Peterborough, Black Buzzer, boat; 6lb 7oz Mel Dunn, Eye, white/green lure; 6lb 5oz Ken Nicholls, Farcet, boat; 6lb 4oz Tony Cefai, Fordham, Tequila FAB. Best bank areas are lagoon, dam, boat bay. Best boat areas west arm, dam, boat bay. Best patterns white/green lures, Olive or Black Snakes, Damsel, GRHE, Red Diawl Bach, Bloodworm, Olive Buzzer. For a taste of the fishing last Wednesday at Elinor take a look at YouTube ‘A great February day at Elinor Trout Fishery’. Continued milder conditions throughout this week, has provided anglers with the opportunity to tempt some of the fish up to dries. Other anglers found various lures to still produce some decent bag numbers. Buzzers and Diawl Bachs have also been picking up fish, which are feeding subsurface. Despite the warmer air temperatures the wind chill can still make it feel rather cold. The temperatures are set to rise this coming week; so we may begin to see some nice early evening rises. Thrunton held a TEFF friendly competition this week, where 29 anglers travelled from as far as Cumbria to help raise some money for the England Bank Team. Alec Harvey from Cramlington won the friendly competition and David Parker landed the first fish of the day. The competition was scored using a playing card system, where the best poker hand wins. Prizes were also given to anglers who were dealt a Joker from the deck of cards. Thank you to all anglers who attended the event and Lee Cartmail for organising the event. Trevor Wadds from Longframlington enjoyed his three visits to Thrunton this week, safely returning a total of 20 fish using Bloodworms and Diawl Bachs. Morpeth angler, David Kay landed 17 fish between both lakes over his two visits, all caught using lures. Duncan Passmore from Ponteland released 6 fish from Long Crag using dries at the beginning part of the week. D. Nunn used an Amber Bloodworm to safely return 6 fish to Long Crag, having a ‘nice day’. Julian Bales landed 7 fish from Long Crag. Jordan Lisle used various lures to safely release 8 fish to Long Crag. Rob Hall from Morpeth returned 30 fish over his three visits to Thrunton using Buzzers. Ken Glenton from Ashington used a Black Gnat to land 11 fish from Long Crag. Barry Teasdale caught 6 fish from Long Crag using Buzzers and Diawl Bachs having a ‘great day’. Bedlington angler, Mick Brown had a ‘canny day’ returning 18 fish between both lakes also using Buzzers and Diawl Bachs. Peter Kerr had a ‘nice afternoon session’ landing 7 fish from Coe Crag also using Buzzers and Diawl Bachs. Blyth angler, Rodney Burn landed 11 fish from Coe Crag using Blobs and Bloodworms. Fly box: Buzzers, Diawl Bachs, Black Gnats, Bloodworms, small dries and various lures. Fishery open daily 8.30am to 5pm. Please note: The Fishery (both lakes) will also be closed on February 23-24 for a Fritz ‘n’ Flies competition. Apologies for any inconvenience caused to our regular anglers. Chris Laidlaw's beautiful wild brown trout from the Gin Pool at Bigwell fishery. Most days this week consisted of blue skies and a bit of sunshine accom-panied by colds winds, which has challenged anglers. Andrew Williams landed 3 fish and lost 4, all on a Cat’s Whisker from the Lower Lodge Pool. Hugo Perks had a good morning, catching 2 fish to take home for the freezer. Ricky Harrison landed 5 and Gary Harrison caught 3 on Squirmy Wormies and Cat’s Whiskers. On catch and release tickets were Colin Gooch who caught 5, Chris Laidlaw had his bag limit of 10 including a beautiful wild brown trout taken on a Bumble fly from the Gin Pool and 1 blue trout. Also catching their bag limit were Ben Andrews, John Burton, Lyndon Harris, Phil Roe and Mick Smith. Steve Gray caught his 10 fish limit, all on Apps’ Bloodworm, 4 from the Gin Pool with a fast retrieve and 6 from the Lower Lodge Pool fished static about 2 feet down. Steve tried a few other flies but was successful on just the Apps’ Bloodworm. On catch and kill Basil Freeman took his 3 fish, Harry Webb took 3, G. Rob-erts 3, Graham Jeremiah 3, S. Price 4, Alan Brunt 1, Gary Tucker 4, Ad-am Davis 1, Tom Johnson 3, D. Perrin 3, John Lyall 6. Popular flies this week have been Apps’ Bloodworm, Squirmy Wormies, Chamois fly, small Black Buzzers, Green Spiders and Klinkhamer. Bigwell is open every day from 7.30am.